This transparent oddity is a Turtle; a piece of technology from a bygone age of ICT, and the relic that tmcd35 correctly guessed was the piece of hardware I had not seen since I was 5 years old. Long before Lego Mindstorms, there was the Turtle. Originally conceived in the ’40s for use in computer science teaching in universities, this model made it’s way into primary school classrooms in the ’80s. British denizens of a my generation will remember it as the first computer-controlled robot they ever encountered, and were able to program and drive themselves using the LOGO functional programming language on a BBC Microcomputer. It connects to the computer via a serial cable plugged into the socket on the top. In the very centre is a pen grip, to which one can attach a pen through the bottom of the unit to draw pretty patterns on the floor (usually lined with paper). The arrow on the front is an example of a very common end-user modification to identify which way is ‘forward’ to the robot. 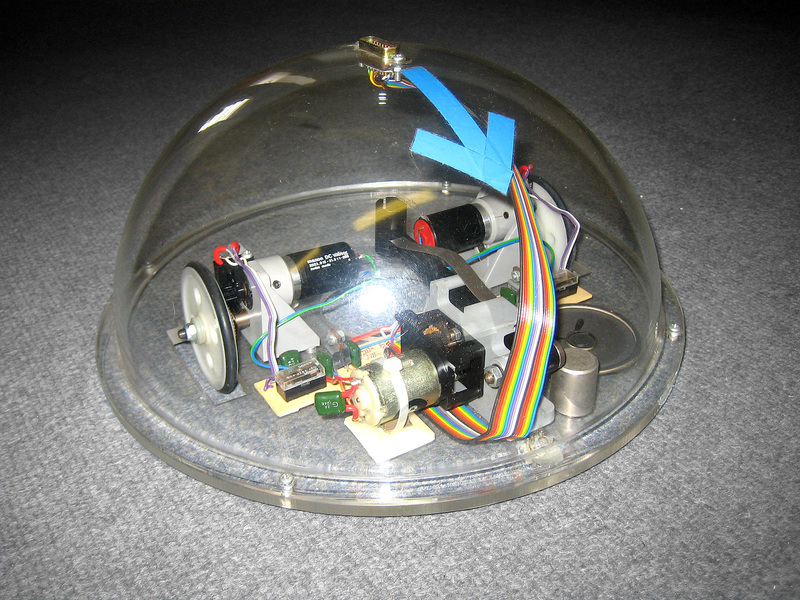 Although a technically-minded person will come to recognise the orientation from the layout of the internal components, a child normally has some difficulty determining which way a perfectly hemispherical robot is going to move. I have no idea whether this unit is still functional. I dream of one day firing it up again, but even if I can’t, I will never have the heart to throw it out. Christ, it’s been years since I used one of them. I remember it in Maths (not Computing) scurrying around the floor. Happy memories! According to Wikipedia the Mouse was invented at MIT in 1969 and the BBC micro was invented in the 1980’s. Do you have a reference for your comment that the mouse was originally conceived in the 40’s? My comment about the 40s was about the conception of the turtle, not the mouse, and was a reference to the work of Grey Walter. In fact, his robots (which he called tortoises) were in some ways more advanced than the turtles used with the BBC micro, as they were untethered and powered by batteries. Fascinating. Thank you so much.